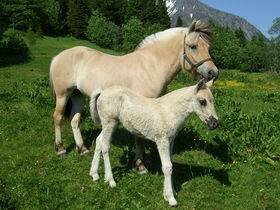 The Norwegian Fjord Horse is one of the world’s oldest and purest breed of horse. It is believed that the original Fjords migrated to Norway and were domesticated 4000 years ago. Herds of wild Fjord Horses existed in Norway after the last ice age. Archaeological excavations at Viking burial sites indicate that the Fjordhorse has been selectively bred for at least 2000 years. The first record of a Fjord coming to America was “Danny” purchased by publisher J.D. Lippencott of Philedelphia. He bought the weanling in 1888 and used him for over 22 years as a carriage horse and a riding horse for him and his children. The Fjord is unique in it’s coloring. 90% of Fjords are a brown dun with the remaining being shades of yellow dun, red dun, white or pale dun and grey dun. Most Fjords will have a white mane with a stripe of black running down the center. They often have zebra stripes on their legs and an eel-stripe running down their back to their tail. Some Fjords also have primitive shoulder stripes. Typically Fjords will be between 13 1/2 and 14 1/2 hands high and weigh between 900 and 1100 pounds. There are variations on both sides of those measurements, however. Fjord Horses are extremely hardy, being efficient foragers and quite adaptable to most climates and altitudes. Fjords have excellent hooves. Many people never shoe their Fjords. Fjord Horses are bred for their wonderful versatility. They perform well while ridden, driven, doing draft work or packing. They tend to be whole-hearted about their work. Perhaps the most valued quality of the Fjord Horse is its temperament. The typical Fjord is very friendly and gentle. They love people and attention and work hard to please. Fjords tend to be very bold, not frightening easily. They are intelligent and full of character. People who are afraid of other horses will often feel safe and secure with a Fjord. They are an all-around wonderful creature.